The year saw a declining trend in the VC funding for Indian startups in data analytics compared to the year 2016. Yet, Indian Venture Capital (VC) firms have shown significant interest in home-grown startups, which is a good sign for the Indian analytics scenario, as it can lead to more adoption of analytics, among other benefits. To get a quick insight into the analytics funding scenario in India, Analytics India Magazine conducted an independent study, where we have listed down the key findings on investments and funding trends and how the startups fared compared to last year. Halli Labs, a Bengaluru-based AI startup is acquired by Alphabet Inc.
4i Inc, analytics consulting startup acquired by Fractal Analytics. Zarget, a SaaS startup acquired by Freshworks for $18M. 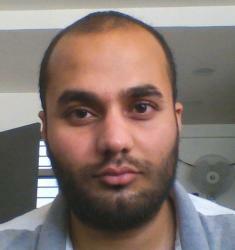 OSSCube, a US startup acquired by Happiest Minds. 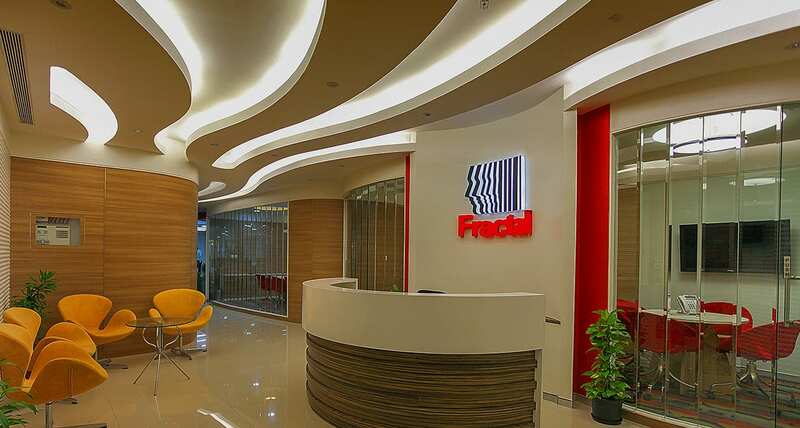 Pragamatix, a retail analytics startup acquired by Crisil for ₹56 Crore (completes acquisition on 24th Jan 2018). DataWave (previously known as ETL Factory) acquired by HCL Technologies for approximately ₹58 crore. Like the year 2016, Qubole bagged a major investment of $25M from rising investors such as Singtel Innov8 and Harmony Partners. This adds to the list of their existing investors Charles River Ventures (CRV), Lightspeed Venture Partners, Norwest Venture Partners and Institutional Venture Partners. Qubole, a startup firm which provides enterprise software and big data solutions is reportedly the largest cloud-agnostic big data platform in the world, growing revenue at more than 100 percent year-over-year. Another in the list is Unbxd, an AI supported e-commerce platform, that received $12.5M from Eight Roads Ventures, which is based in Bermuda and operates mainly in UK, China, Japan and India. Flytxt, an AI based startup that deals with marketing automation solutions received $11M in a series A funding by German investors, DAH Beteiligungs GmbH. This year saw a drastic decline in funding when it comes to the analytics/ data science startup environment, compared to last year which totalled at $210M invested across 20+ deals. This can be attributed to the fact that most companies looked at acquisitions rather than investing in startups. Majority of the investments that flowed in were by foreign agencies, indicating their considerable interest in India’s economic rise, especially in technologies like analytics, big data and artificial intelligence. The year began with no significant funding activities in the month of January and February, which took a strong upside from March, eventually reaching a peak in June and getting stagnant from July to October. 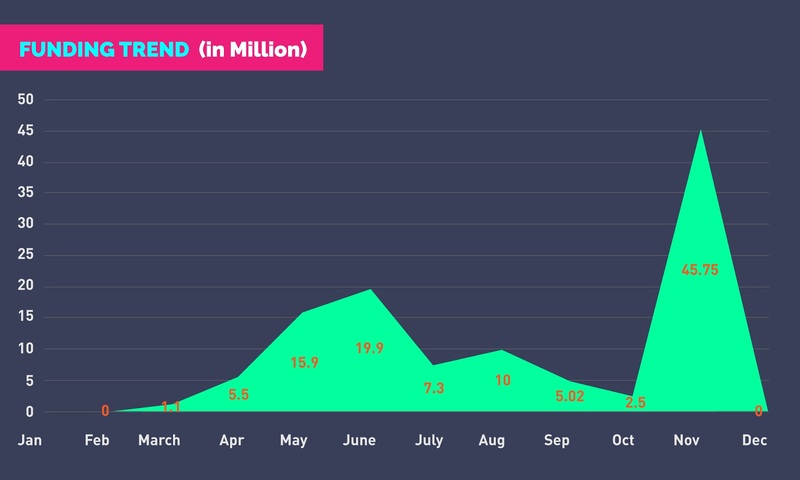 The months of November and December showed a big influx in funding — $45.7M, with many foreign investors at play. 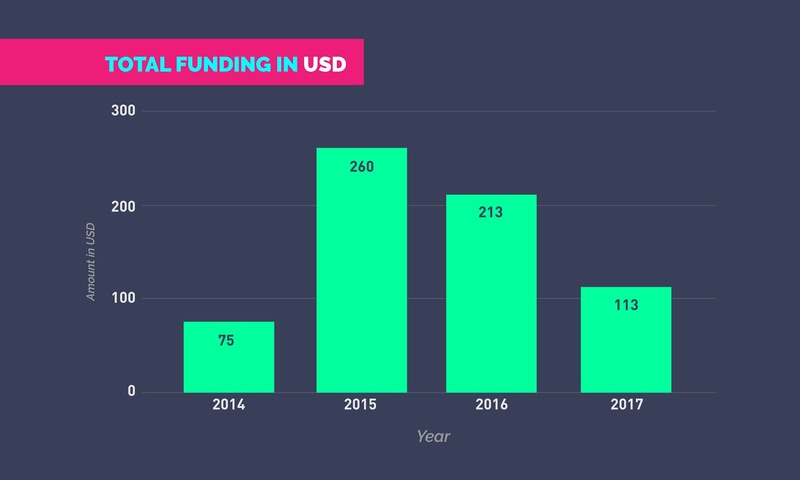 While the year 2016 saw a rise in angel activity, 2017 was mostly scattered around Seed and Series – A type funding. 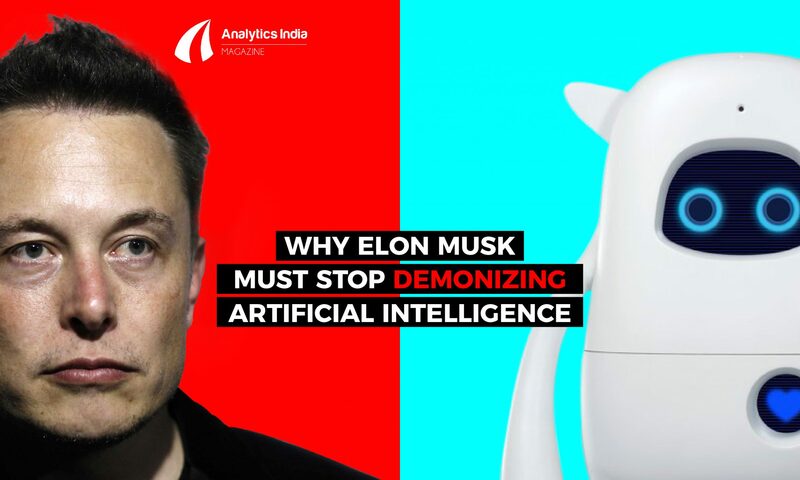 The influx of startups in areas like video analytics, virtual reality assistance, computer vision technology and so on, have grabbed attention of these investors. Some of the firms that received seed and Series A funding are FORMCEPT Technologies and WiFi analytics startup i2e1. 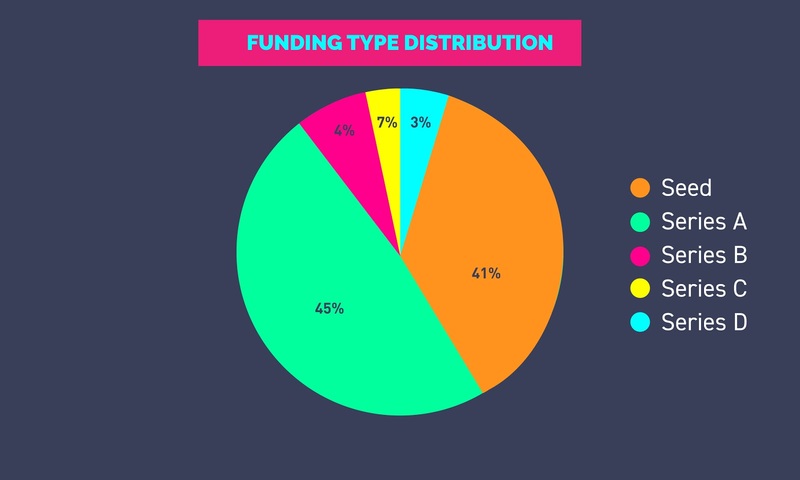 In 2016, Series C funding dominated the startup sectors. However, when it comes to 2017, the funding took a dip by 53 percent. This is because VC firms invest in startups which are stable and bring more investing opportunities such as initial public offerings (IPO). Generally, it takes around 5 to 10 years for a company to mature in terms of financial gains and market footing. 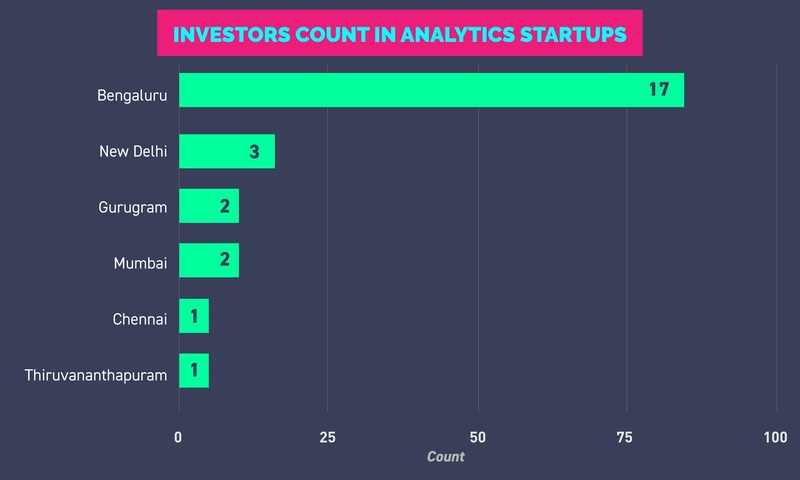 In the coming years, analytics startups will gain traction and are likely to receive large Series C funding. 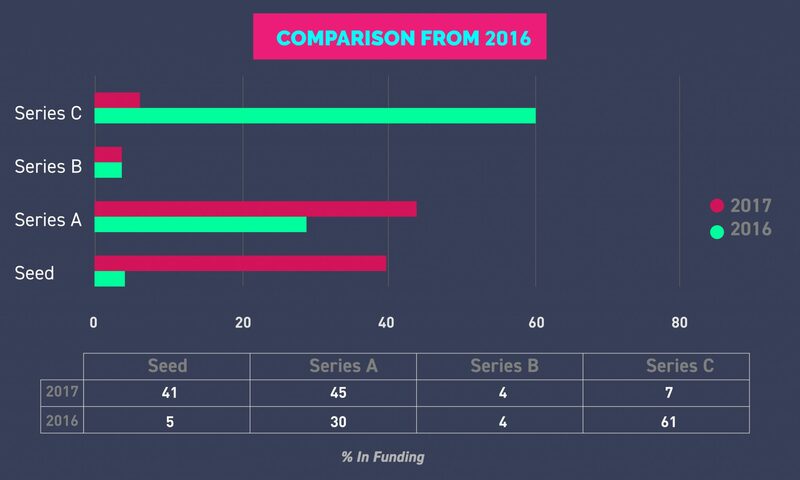 On the other hand, Series A, B and Seed funding have picked up well in 2017. Bengaluru has always been the hotbed of startup funding activity and continues to do well with most of the investment coming from there. Thiruvananthapuram receives the highest funding, with Flytxt accepting $11M for its Indian-based operations here, and would open up more investment opportunities. 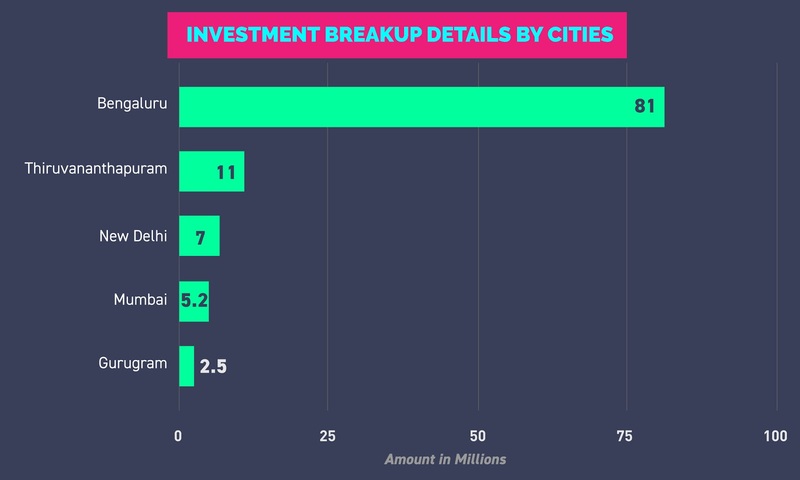 New Delhi, Mumbai and Gurugram trail behind with low investment, unlike last year where Mumbai was leading the game with most number of investments. Yet again, Bengaluru picked the game with 17 startups bagging the most investment. Although, the number is less in major cities like New Delhi and Mumbai, other cities like Chennai and Thiruvananthapuram are grabbing attention from investors. Apart from analytics startups, there were major investments in the startups working on artificial intelligence, NLP and machine learning. 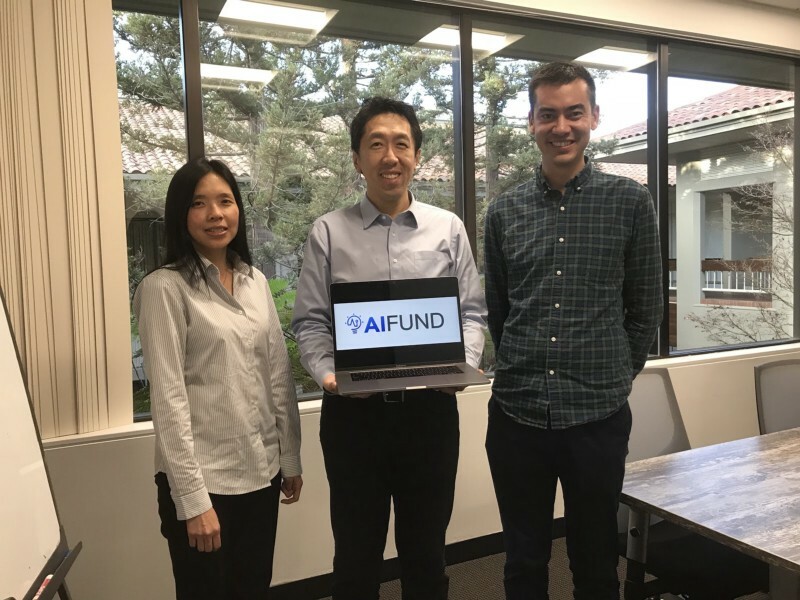 Niki.ai received a $2M Series AI funding from SAP.IO and Unilazer ventures in June 2017, AI healthcare startup Mfine secured seed funding from Stellaris Venture Partners, among others. It may seem that the trend for funding is going downhill, but investors and companies have a differing opinion. Investors believe that the investment in analytics startups will be more profitable if the startups go public on stocks and shares, and likewise companies collaborating with these startups share that the technology would help them cut incurring costs. However, startups must optimise its resources well so that they don’t fall behind in the race.